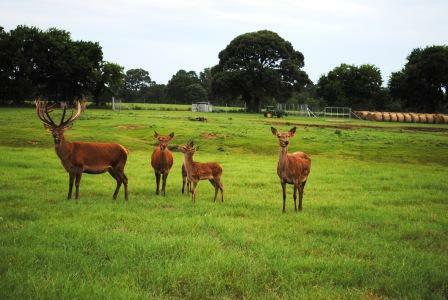 In fall of 2009, the notion of raising red deer came about. These deer have roots from New Zealand and several parts of Europe. As seen by the picture they are bigger than the whitetails, especially those that roam in East Texas. Stags can have up to 40+ points and score into the 500's on B&C. We've started small with just one stag and three hines and of course, mother nature has done the rest. Over the summer they have become quite gentle and certainly like range cubes. When active they like the longhorns have become tourist attractions. All the learnings we had from the longhorn industry have been applied to the Zulu Creek endeavor as we invested in the best genetics we could find and had the seed stock shipped down from Maine. Zulu Creek ranch is located just north of the Silver T location and is known in the area for its natural springs that flow year around. The longhorns that come to the this ranch must have 70 ttt or be on their way to that number. There are several 80 ttt's to be found here as well as 90's ttt and some will never leave as they embody Texas.